There are several nourishing ways to spend your weekend in community. Here are a few we recommend. AWAKEN, DISCOVER, IMPLEMENT THE GODDESS WITHIN! Join Spiritual Medium/Teacher Krista Nerestant of Self-ish Lifestyle Therapy, LifeCoach and Podcaster The Katosphere and Yoga Instructor Mary Lou Burkhardt of Setu Community for an experiential workshop. As we close out this chapter at our beloved Bed-Stuy studio, we’d love to flow and move with grace together. Details below for the Pay What You Desire options to kick off our farewell weekend. Check back here over the next few days for a sneak peek at the schedule – RSVP on Mindbody as these classes will fill up! Join Ally Maz and Sahiti Kovvuri as they host a teen girl event geared towards empowering young self-identified young womxn through movement, meditation, and dialogue. 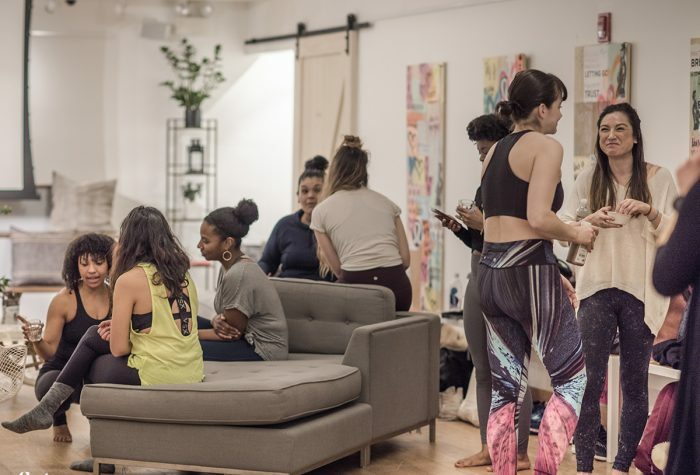 The event will start off with a yoga class with the intention to nurture and ground ourselves to set the stage for honest and real connection and conversation to follow. Join Naimah Efia, in an undeniably necessary conversation series on transforming privilege (and unearned power) into possibilities for a greater social consciousness in practice. Through a series of community-conversations, with workshop components, participants will transform their practice into one that includes karmic social action.